I took a lot of dressage lessons with different teachers who repeated again and again the aids to perform a certain figure, but I never really succeeded. It always ended with the feeling that I was just not talented enough and not worth the attention of a top teacher anyway. Of course I was not "just too bad". I have been confronted with the reality that a technical explanation of "What to do" is one thing, but the transmission of the feeling "How to do it" is something completely different! In the basic training we learn the basics. During the advanced training, the basics are refined. And the high school means playing with the basics in perfection. But let's face it, who was actually taught in class how a half halt feels? Or how to simply turn your horse without pulling on the inner rein? A wonderful tool to make the art of riding accessible for every rider. Equine Dialogue deals with exactly these basics in detail. The integration of all our senses makes it an experience of connectedness of body and mind. 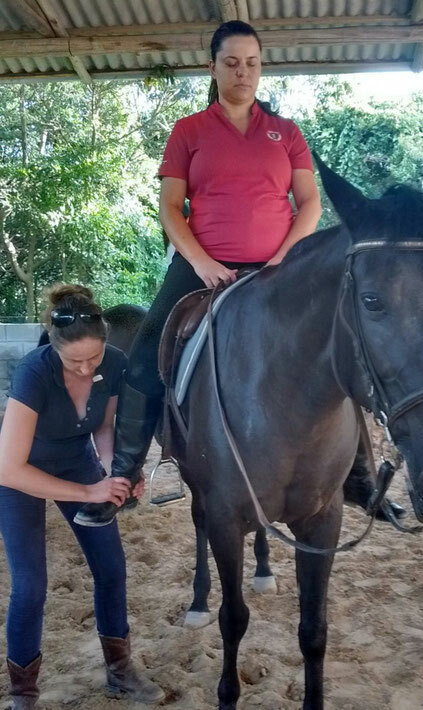 "It is a mix of riding lesson and guided meditation." We use the aspect that our brain does not differentiate a well-made visualization from reality. That helps us to produce "inner videos" which ensure long-term learning success and can be retrieved at any time, regardless of the presence of a trainer. The combination of concrete instructions with pictures, associations and sounds also appeals to both brain hemispheres equally. Our thoughts play a key role. Each of our thoughts triggers minimal muscle contractions that are naturally perceived by the horse and that change the common balance. You can see that immediately - on the rider as well as on the horse. The aim is to put the rider in a state of perception that allows an intense feeling of the movements of the horse and his own body. We take care of the practical information, but also of the "right frequency" for communication with invisible aids. to this wonderful unity with the horse and everything around us. And suddenly everything becomes possible, the dialogue can begin!